March 15–October 15 campfires are not allowed between 8am-2pm. 75% of the province is covered by forests. 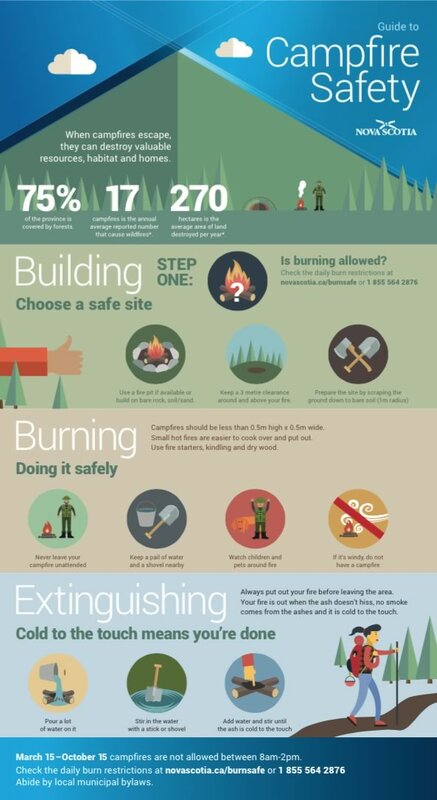 Choose a safe site to build your campfire. Is burning allowed? Check the daily burn restrictions. Use a fire pit if available or build on bare rock, soil/sand. Keep a 3 metre clearance around and above your fire. Prepare the site by scraping the ground down to bare soil (1m radius). Campfires should be less than 0.5m high x 0.5m wide. Small hot fires are easier to cook over and put out. Use fire starters, kindling and dry wood. Keep a pail of water and a shovel nearby. Watch children and pets around fire. If it’s windy, do not have a campfire. Always put out your campfire before leaving the area. Your fire is out when the ash doesn’t hiss, no smoke comes from the ashes and the remnants are cold to the touch. Pour a lot of water on it. Stir in the water with a stick or a shovel. Add water and stir until the ash is cool to the touch.